It is the profound pleasure of SoCal Swordfight to announce that Francesco Lodà will be joining our list of instructors for the upcoming 2019 event. Francesco is both a highly accomplished tournament competitor as well as historical martial arts researcher. 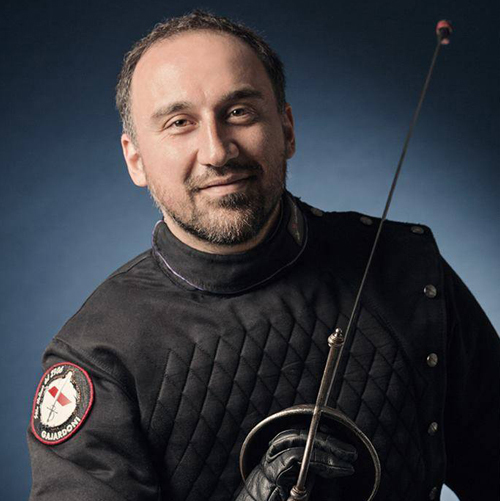 Francesco Lodà started his career in historical fencing in 1999. As a teacher and trainer he has reached 14 technical titles thus far and graduated as “Maestro di Scherma Storica/Maestro d’Armi” from F.I.S. (Italian Fencing Federation), CSEN, UISP, A.I.M.A. (Italian Association for Master-at-Arms). He also graduated as “Military Master-at-Arms” from USA Sonoma University, and as an “Athletical Trainer” from the Italian Olympic Committee. As an athlete, he is the world's most rewarded athlete for rapier fencing. He took part in the biggest international competitions between 2003-2018, including, among many, A.I.M.A. Roma, Swordfish, and Longpoint. He has earned over 50 medals in competition, 38 of those being gold, along with numerous technical excellence awards. We are so excited to have Francesco coming as our first transatlantic instructor to SoCal Swordfight! Register Today for your chance to learn from this phenomenal instructor. To view the live schedule with class times and instructors for SoCal Swordfight 2019, click here. Times, Instructors, and Classes are Subject to Change.